Denis Shapovalov quickly became a household name in 2017, capturing the attention of the tennis world with his style and success. But as a new season begins, can the Canadian teenager sustain that hard-charging momentum and establish himself as the sport's face of the future? Shapovalov looks on in his match against Gianluigi Quinzi of Italy at the Next Gen ATP Finals on Nov. 8, 2017 in Milan. It was no ordinary afternoon at the Mayfair Club on Toronto's Lake Shore Boulevard East, as fascinated members buzzed around the lobby, waving one another over to the glass walls overlooking the tennis courts for a glimpse of the wonder kid. They steadied their phones and clicked away, snapping shots of the flashy, fair-haired teenager who had them glued to their televisions months earlier, fist-pumping as he dispatched ATP stars such as Rafael Nadal, Juan Martin del Potro and Jo-Wilfried Tsonga from late-season tournaments. There he was, in the flesh, bounding around in his backwards cap, crushing his formidable one-handed backhand. It was a mid-November day and 18-year-old Denis Shapovalov was a surprise guest at the fitness and racquet club, slugging away as a camera crew filmed commercial footage for the sports nutrition company BioSteel. Up since 4 a.m., Shapovalov had squeezed in a few in-studio TV interviews before the commercial shoot. As his ATP ranking skyrocketed from No. 250 to 50, so had requests for his time. So on a rare, brief trip to his hometown, his management team was being choosy. When the shoot finished in the early afternoon, he sat down courtside for his last appointment of the day. He smiled and shook his head with a sort of boyish amazement as he ran through the events of 2017. Winning Junior Wimbledon in 2016 turned heads, but his shocking runs at the Rogers Cup and the U.S. Open last year were life-changing. Fellow ATP players voted Shapovalov the tour's most improved player and he earned the Star of Tomorrow award as the youngest player in the top 100. The Canadian Press named him Male Athlete of the Year. His star was also rising off the court. He appeared in Vogue magazine and landed a global endorsement deal with Swiss watchmaker Tag Heuer. His arrival on the ATP tour was brazen, resulting in a number of "youngest ever" and "youngest since" distinctions. At Montreal's Rogers Cup, he became the youngest player ever to make the semi-finals of an ATP Masters 1000 event. At the U.S. Open in New York, he was the youngest to reach the final 16. As his ranking climbed, he became the youngest to crack the top 50 since Nadal in 2004. After that whirlwind late-summer performance, many wondered: What could he do with a full season on the ATP World Tour? That opportunity begins now. 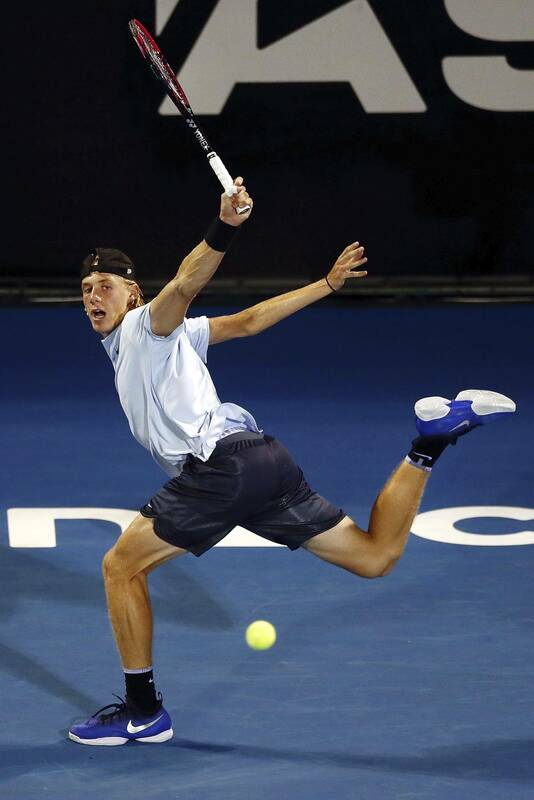 Shapovalov's ranking has landed him his first main draw entry to a Grand Slam – the Australian Open, which begins Monday. He'll face 19-year-old Stefanos Tsitsipas of Greece, a former Junior No. 1, in the first round. Now ahead of schedule on his career path, Shapovalov won't need another season playing Juniors, Futures or ATP Challengers. There will be other Canadians in Melbourne. No. 23 Milos Raonic and WTA No. 83 Eugenie Bouchard have gotten achingly close to an elusive Grand Slam title, enjoyed stardom and battled injuries, setbacks and plateaus. But at least for the moment, Shapovalov is stealing the spotlight as Canada's most intriguing tennis star. Last off-season he was between coaches and ranked No. 250 with a focus on playing Challengers. He had no team of his own and instead trained in Tenerife, Spain with Dominic Thiem. He joined forces full-time with Tennis Canada coach Martin Laurendeau and a bright 2017 was under way. "Now here I am this year and my team has grown, with full-time physio and fitness guys with me on the road every day too – way more professional," Shapovalov said. "The results I had were unbelievable – just crazy. But that's over now, and I know it's not realistic to believe I'll have a drastic leap like that every year. I'm just so excited to get back at it." Shapovalov reacts after defeating Adrian Mannarino of France at the Rogers Cup on Aug. 11, 2017 in Montreal. Following his fourth-round exit at the U.S. Open, Vogue editor Anna Wintour personally invited him to fly back from Toronto to New York for a photo shoot with American supermodel Karlie Kloss. Both posing in designer sportswear, Shapovalov also wore his signature backwards cap in a photo for the November issue. She was a grinning onlooker as the camera captured Shapovalov in mid-air, showcasing his athleticism in an exuberant game of ping pong. "I was actually really nervous – I didn't know how models would act, but she was super nice and really cool and kept it fun for me because she could clearly see I had no idea what I'm doing in a magazine shoot," Shapovalov said. "They had her doing lots of changes of hair and makeup and clothes for various photos all day. They took one look at me and said, 'Um, okay, yeah, your hair is fine, you're good to go.'" Several business offers filed in to Shapovalov's manager. Tag Heuer was quick to add him to its star-studded stable of athlete endorsers. Rare is the tennis star who doesn't slide an eye-catching timepiece on his or her wrist before news conferences and trophy ceremonies. "His future is looking very bright indeed," said Jean-Claude Biver, CEO of Tag Heuer, when announcing the deal. "He will enable us to reach the younger generations." Shapovalov was invited for a personal tour of the company's Swiss headquarters in La Chaux-de-Fonds. He perused the impressive watches in glass showcases and observed expert watchmakers turn tiny screws that looked to him like grains of sand. "It is a big deal to get a watch deal, no doubt," Shapovalov said. "Tag has quite a list of athletes – Tom Brady, Cristiano Ronaldo, Henrik Lundqvist, Kei Nishikori – it's crazy. Pretty good for me to be part of a family like that." Shapovalov signs autographs for fans after defeating Rogerio Dutra Silva of Brazil on day five of the Rogers Cup on Aug. 8, 2017 in Montreal. The fall months brought no break from tennis. Shapovalov anchored Canada's Davis Cup victory over India in Edmonton. Then John McEnroe chose him for his Team World at the inaugural Laver Cup to face Bjorn Borg's Team Europe in a glitzy Ryder Cup-style tournament. Shapovalov played deep into the ATP fall calendar, Skyping home to his parents every day. On the road, combatting fatigue, illness and homesickness, there were far fewer wins. He lost out in the first round of tournaments in Shanghai, Antwerp and Paris but found one win at the Swiss Indoors in Basel. His hectic season ended in Milan at the Next Gen ATP Finals, an event for the tour's best eight players under 21, where he was eliminated in the round robin. During that tough stretch, his mom, Tessa, flew to Europe to be with him. "It was good to have her there. When my mom's there, I'm not as lonely," Shapovalov said. "It was really tough mentally with the sickness and being away from home for so long. I had a couple of chats with the team, telling them how tired I was and really just wanting to go home, but I pushed through and I think I did a good job of finishing on a good note in Milan. It's something I need to learn still – I'm still young, and travelling and being away from my parents is still hard." If 2017 was his breakout year, his challenge for 2018 will be to prove he can sustain his hard-charging momentum while playing with the best on a regular basis. His coach has watched his teenage pupil adjust to life on the big tour. He says he has noticed Shapovalov's increased comfort around top players despite the fact he's only 18 and many of his counterparts are older players with wives and families. He sees more players stop to talk with the teen rather than just wave or nod. Shapovalov speaks to the media during the Next Gen ATP Finals Media Day on Nov. 6, 2017 in Milan. "He's hitting the tour now feeling he belongs, unlike last year when he was like an uninvited guest springing up to crash some tournaments. That really shows in his demeanour," said Laurendeau, who was in Auckland, New Zealand, this week as Shapovalov competed in a tune-up tournament ahead of the Australian Open. "It's easier to find practice partners for him now, that's for sure. I don't have to sell him like I did before, when I'd say, 'Hey, do you want to hit with this guy? His level is pretty good! They all know now they're going to get a good workout with him." Not only do they know Shapovalov's name, they know his game. "Tactically you can work on new patterns in the off-season, because the players last year didn't really know Denis and he was coming out of nowhere, so he had an element of surprise, which really favoured him," Laurendeau said. "But now, guys have watched him practise, they've watched him play, they've studied him on YouTube. So we've been working to stay ahead of the game." Laurendeau still considers this part of Shapovalov's rookie year on the tour – until the Rogers Cup comes around. He's never played many of the tour's premier stops, such as Miami, Indian Wells, Monte Carlo, Rome and Barcelona. His mother, a former national team player for the Soviet Union who has coached him since he was five, remains one of his coaches, in collaboration with Laurendeau. She stays home running her tennis academy, TessaTennis in Vaughan, Ont., while Laurendeau is with Shapovalov every day. They talk regularly and make decisions together, and she joins them on the road when she can. He likes having his mother there. Shapovalov serves against Adrian Mannarino of France during the Rogers Cup on Aug. 11, 2017 in Montreal. Soon after Shapovalov's arrival in New Zealand, the ATP tour tapped him and some other players to make an appearance with the Skycity Breakers, Auckland's professional basketball team. He showed up in a Toronto Raptors shirt and played some 3-on-3 with some of his peers, including his first-round opponent, Tsitsipas. "He's discovering that the obligations are not going to go away – all the top players have it and they all have to learn to manage how much fuel that will take from you and how much you need to leave in that tank for the match," Laurendeau said. "Guys like Federer and Nadal seem to juggle all of it in their sleep and even enjoy it." Shapovalov has a 1-2 record so far in tune-ups for Melbourne, including a loss in Auckland to del Potro in the round of 16. Shapovalov's team focused on making the teenager stronger, faster and more explosive for 2018, equipped to match full-grown men at the top of their games on a daily basis. "All the top 50 guys have a big team around them, and now he does too, and that's reassuring for Denis to know he's not alone and that he has people looking out for him all the time," Laurendeau said. "We hope that takes a little of the pressure off him."